We, at 'PARASHAR HOSPITALITY SOLUTIONS PVT. LTD.' and our affiliated companies worldwide, are committed to respecting your online privacy and recognize your need for appropriate protection and management of any personally identifiable information ("Personal Information") you share with us. "Personal Information" means any information that may be used to identify an individual, including, but not limited to, a first and last name, a home or other physical address and an email address or other contact information, whether at work or at home. In general, you can visit FOREHOTELS.COM's Web pages without telling us who you are or revealing any Personal Information about yourself. Third parties provide certain services available on www.forehotels.com on PARASAHR LOGISTICS's behalf. 'PARASHAR HOSPITALITY SOLUTIONS PVT. LTD.' may provide information, including Personal Information, that 'PARASHAR HOSPITALITY SOLUTIONS PVT. LTD.' collects on the Web to third-party service providers to help us deliver programs, products, information, and services. Service providers are also an important means by which 'PARASHAR HOSPITALITY SOLUTIONS PVT. LTD.' maintains its Web site and mailing lists. 'PARASHAR HOSPITALITY SOLUTIONS PVT. LTD.' will take reasonable steps to ensure that these third-party service providers are obligated to protect Personal Information on PARASAHR LOGISTICS's behalf. 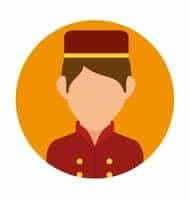 'PARASHARLOGISTICS' does not intend to transfer Personal Information without your consent to third parties who are not bound to act on PARASHAR HOSPITALITY SOLUTIONS PVT. LTD.'s behalf unless such transfer is legally required. Similarly, it is against PARASHAR HOSPITALITY SOLUTIONS PVT. LTD.'s policy to sell Personal Information collected online without consent. 'PARASHAR HOSPITALITY SOLUTIONS PVT. LTD.' will not contact children under age 13 about special offers or for marketing purposes without a parent's permission. We provide the information to trusted partners who work on behalf of or with 'PARASHAR HOSPITALITY SOLUTIONS PVT. LTD.' under confidentiality agreements. These companies may use your personal information to help 'PARASHAR HOSPITALITY SOLUTIONS PVT. LTD.' communicate with you about offers from 'PARASHAR HOSPITALITY SOLUTIONS PVT. LTD.' and our marketing partners. However, these companies do not have any independent right to share this information. 'PARASHAR HOSPITALITY SOLUTIONS PVT. LTD.' reserves the right to update, change or modify this policy at any time. The policy shall come to effect from the date of such update, change or modification. Disclaimer PARASHAR HOSPITALITY SOLUTIONS PVT. LTD. does not store or keep credit card data in a location that is accessible via the Internet. Once a credit card transaction has been completed, all credit card data is moved off-line only to ensure that the data/credit card information received is not accessible to anyone after completion of the on-line transaction and to ensure the maximum security. Info Edge India Ltd uses the maximum care as is possible to ensure that all or any data / information in respect of electronic transfer of money does not fall in the wrong hands. PARASHAR HOSPITALITY SOLUTIONS PVT. LTD. shall not be liable for any loss or damage sustained by reason of any disclosure (inadvertent or otherwise) of any information concerning the user's account and / or information relating to or regarding online transactions using credit cards / debit cards and / or their verification process and particulars nor for any error, omission or inaccuracy with respect to any information so disclosed and used whether or not in pursuance of a legal process or otherwise.